Ebay is offering amazing deals and promo offers through which you can buy lots of products and other items. 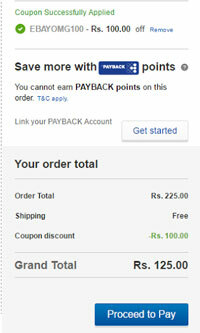 Here is the offer in which Ebay is offering Rs. 100 discount on purchase of Rs. 200 which is valid for new users only. To get this offer at Ebay India, please follow the below mentioned some easy steps.